Wonder Check Cord by Delmar Smith -- 12 ft. . $29.99. Great tool, a must have in your dog training tool bag!!! "This lead/check cord is amazing!!!" This lead/check cord is amazing!!! Within hours my pup was responding to heel/sit command, and the 12ft length allows you to start off with short distance here command sets. Highly recommend this amazing tool!! "The original, and still the best." "I love the wonder lead." I love the wonder lead. "Overpriced, but such a simple thing that really works." Overpriced, but such a simple thing that really works. I use my shorter version more often. It's stiff in the hand, which takes getting used to, and I don't think it will soften, which is probably why it works so well. I have used all sorts of choke chains, slip collars,, martingales, and pinch collars on my very exuberant griff pup, and this works as well or better. Easy to slip on and the dog respects it. "The wonder leash works very well." The wonder leash works very well. My 6 month old pup caught on very fast with very minimal corrections. We were working on come, heel, sit, and general walking on leash qualities. "Customer service was excellent when I needed to confirm some order details." The lead came highly recommended, and I was impressed with the design. It has been very effective in training my GS. Customer service was excellent when I needed to confirm some order details. Very responsive tool for getting your dog in check. Bar none the Delmar Smith check chord is the lead I'll take in the field or to do obedience with our dogs. Easy to use and easy on my dog. Great product. Works great, the best training aid on the market. "Prefer the 6ft lead. You were out of stock." Prefer the 6ft lead. You were out of stock. "Found it to be a little cumbersome." Found it to be a little cumbersome. 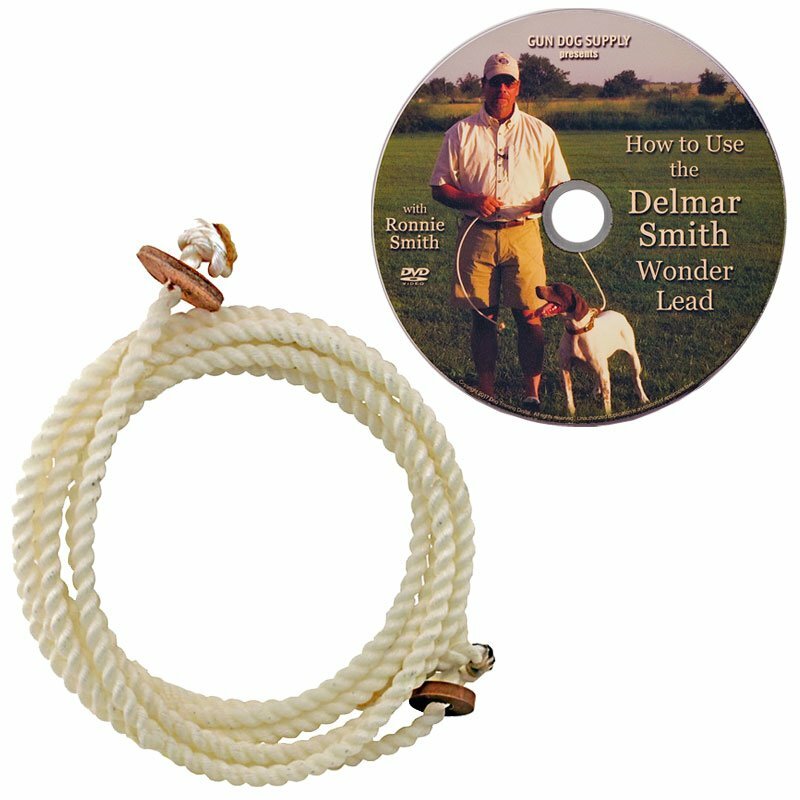 Wonder Check Cord by Delmar Smith -- 12 ft.
Includes FREE exclusive Wonder Lead training DVD featuring Ronnie Smith! The Wonder Check Cord is a great addition to the Wonder Lead. At 12 feet it allows you to take the lessons that your dog has learned close up with the Wonder Lead and move them out to a longer distance. With the use of the simple illustrated instructions you can encourage boldness in a shy dog or decrease boldness in a bold dog. Great for Pointing Breeds, Retrievers, Show, Obedience or Family Dogs. Made of durable, flexible plastic. Not intended as a drag lead. We recommend wearing gloves when using the Wonder Lead. Always start with your Wonder Lead around the dog's head, directly behind the ears. For dogs that jump and pull on the Wonder Lead, place the loop under the ear next to you and over the opposite ear. Give tension and release. repeat until the dog quits without a command. After your dog responds to the tension alone, combine the command with tension, then release. NEVER KEEP CONSTANT TENSION ON YOUR WONDER LEAD. 1. Put the Wonder Lead over the dog's head and position the loop in the center of the head. Slide keeper 1 to 2 inches from the loop. This will keep the Wonder Lead in position. 2. To get more control if needed put the Wonder Lead in front of one ear and behind or under the other ear. A light pull and release is all that is ever needed. 3. When using the Wonder Lead to teach the command "HEEL," if your dog tends to push into your leg place the Wonder Lead in front of the ear closest to your leg (left handed people dog on right, right handed on left) and behind the ear away from your leg with tension across the top. Pull and release while giving the command. 4. If your dog wants to jump and pull hard when starting, put the Wonder Lead in front of both ears. Pull and release until the behavior is under control. Then change the Wonder Lead to just one ear. Pay close attention to the tension on your Wonder Lead. 5. A light pull and release is all that is ever needed with the Wonder Lead. NEVER KEEP THE TENSION TIGHT. Wonder Lead by Delmar Smith -- 7 1/2 ft.